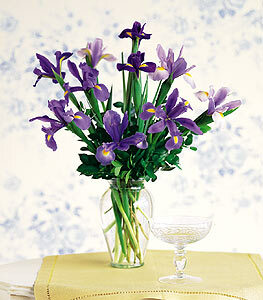 A simple clear vase filled with 10 long stem, purple, iris and foliage. No fussiness, just flowers-a beauty for man or woman. Also in white or yellow – a little elusive – but ask! Also in white or yellow – a little elusive – but just ask!